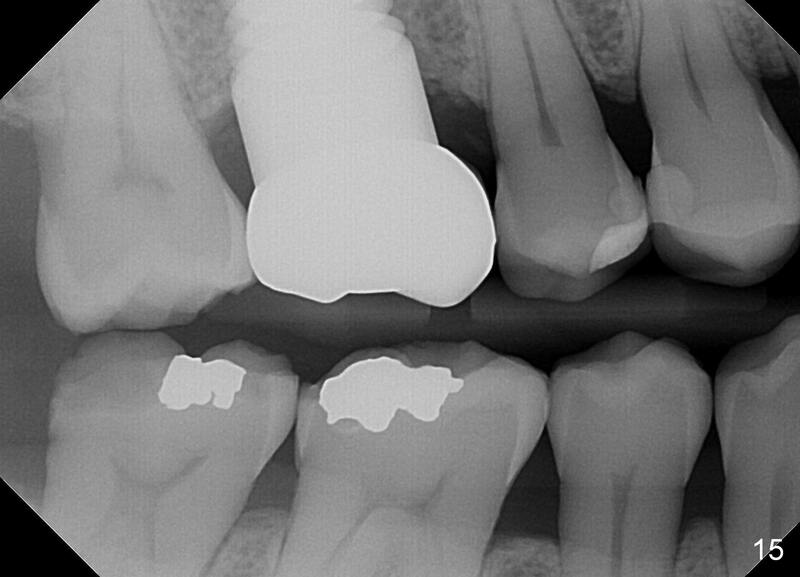 How to Place Immediate Implant for the Upper 1st Molar When the Septum is Not Thick Enough? 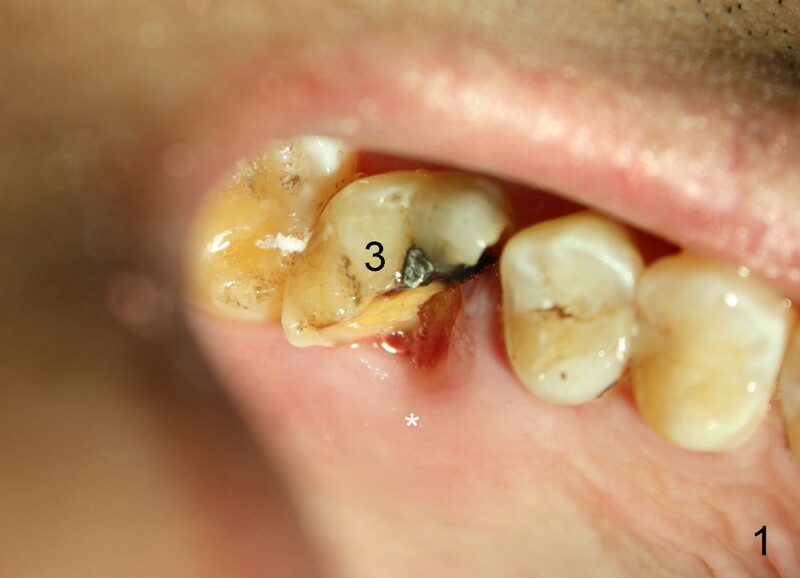 When a bruxer fractures an upper 1st molar (Fig.1: #3), the septum is assumed to be large enough to hold an implant. 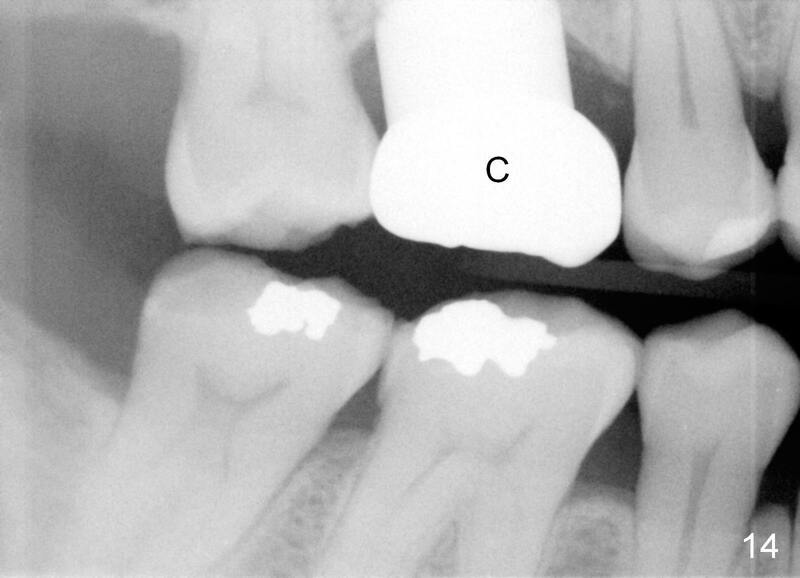 In fact, the septum of this case is relatively thin (Fig.2*; CBCT may reveal the morphology of the septum). There is no septum between the buccal roots, probably due to pre-existing infection (<). The buccal plate is defective. 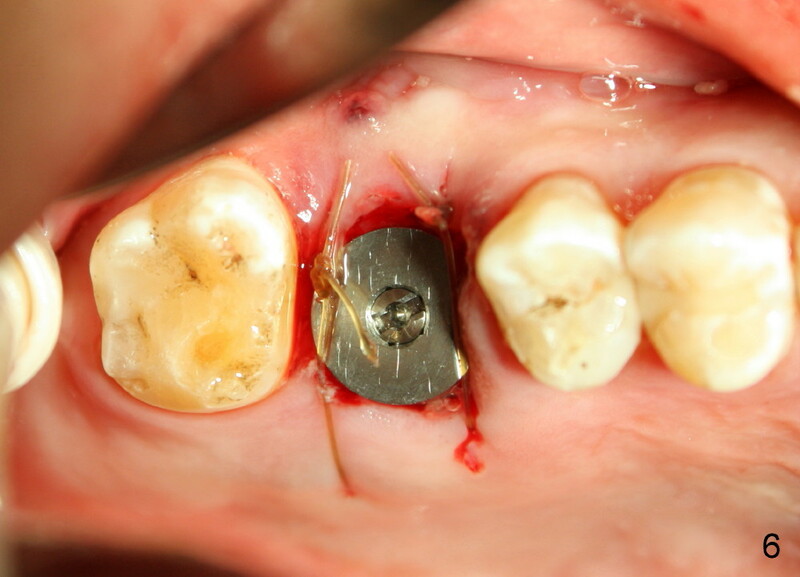 The palatal socket (P) appears to be the most appropriate site for implant placement. The angulation of the palatal socket allows the coronal end of the implant to be in the middle of the socket (buccolingually). But it is tilted, not in the long axis of the tooth. 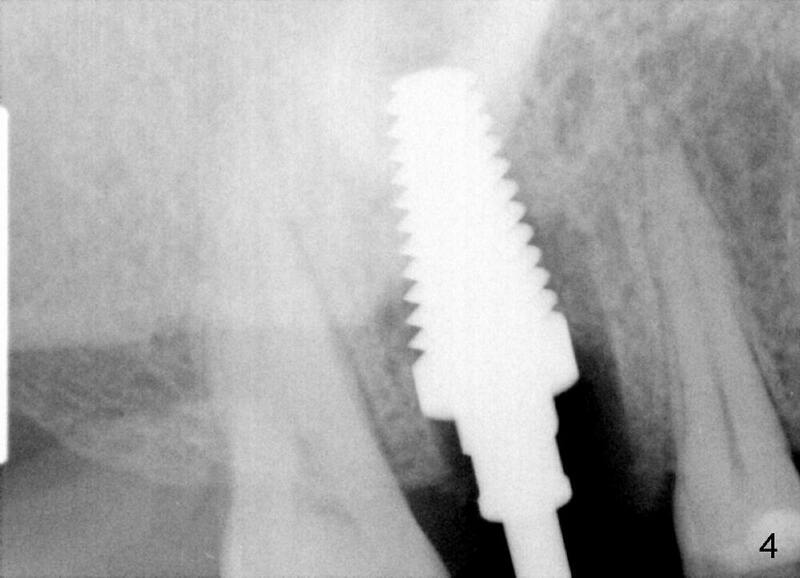 It would be ideal to move the apical end of the implant buccally to certain degree. In order to do that, the septum is sectioned buccolingually (Fig.3 white line) with a series of blade shaped osteotomes (bone scalpel, bone blade, D shaped spreaders, Tatum Surgical). Probably due to extensive apical bony lesions in the buccal and palatal sockets, sectioning with the osteotomes is relatively easy, approximately 17 mm deep. The osteotomy is initiated in the palatal socket by using a 7x17 mm tap manually (Fig.4). It appears that the sectioned septum undergoes further fracture and are pushed buccally (Fig.3 Inset A: arrows) while the tap is screwed in (white circle). A second associated advantage of the bone expansion is narrowing the buccal socket. 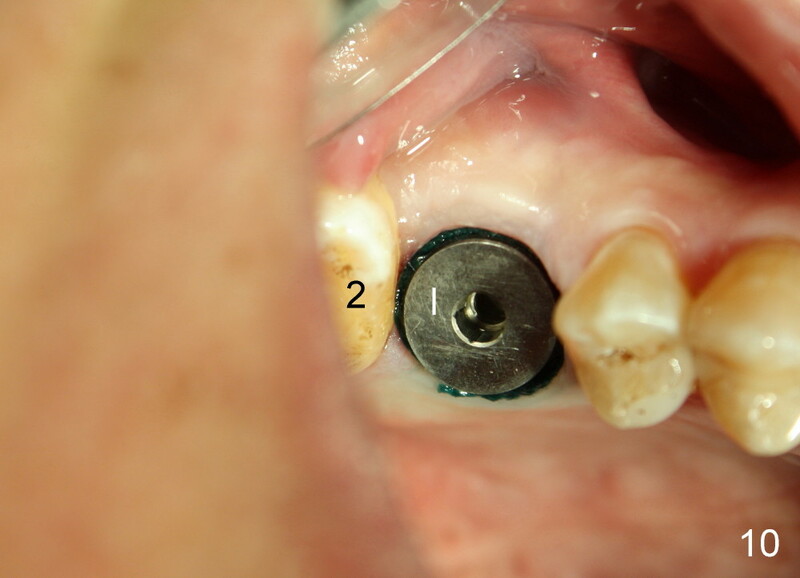 The septum is assumed to be further pushed buccally when a 8x17 mm tap and its corresponding implant (Fig.5) are being inserted. Prior to implant placement, approximately 1 cc allograft is placed in the remaining buccal socket (Fig.3 Insert B: yellow circles). 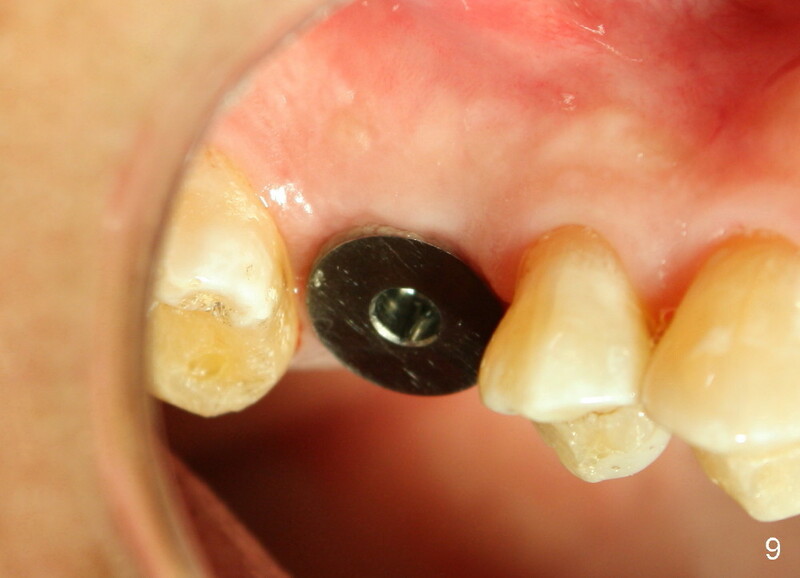 Bone graft granules are visible next to the implant (Fig.5 *). 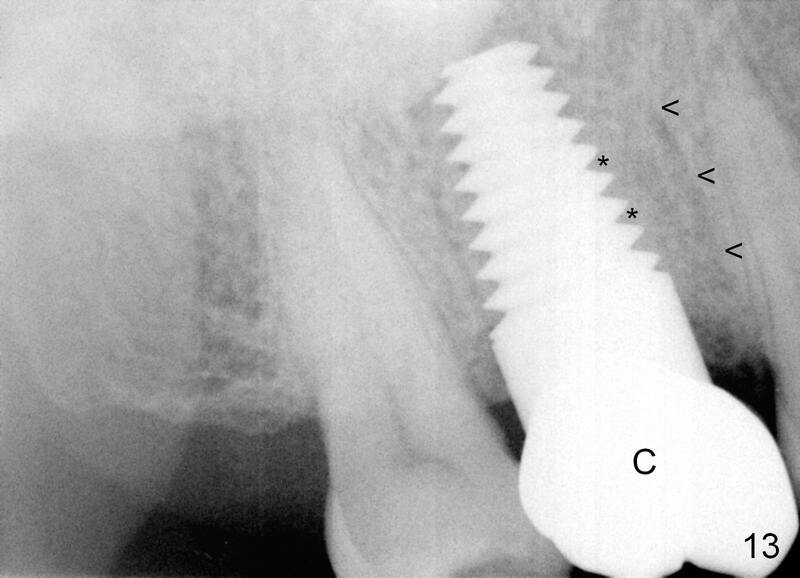 The implant does not look too tilted clinically, more or less in the middle of the socket (buccolingually) (Fig.6). 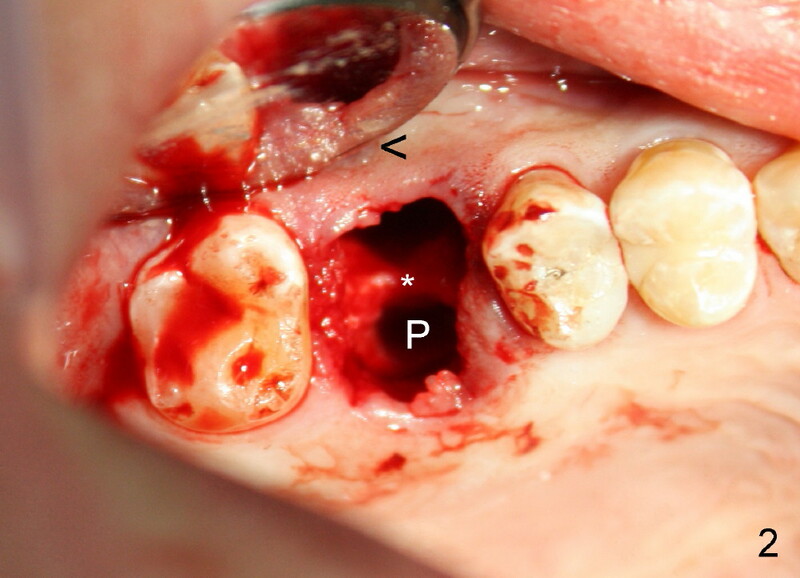 Smaller amount of the graft is placed buccal to the palatal gingiva before suturing. The wound is covered by perio dressing before discharging the patient. The septum could be sectioned by Lindamann bur or surgical high speed fissure bur. The osteotomes are easier, more convenient, bone saving and can reach the deeper portion of the socket. Ten days postop, the gingiva heals around the implant with disappearance of the buccal fistula (Fig.7 <, as compared to Fig.2,6). 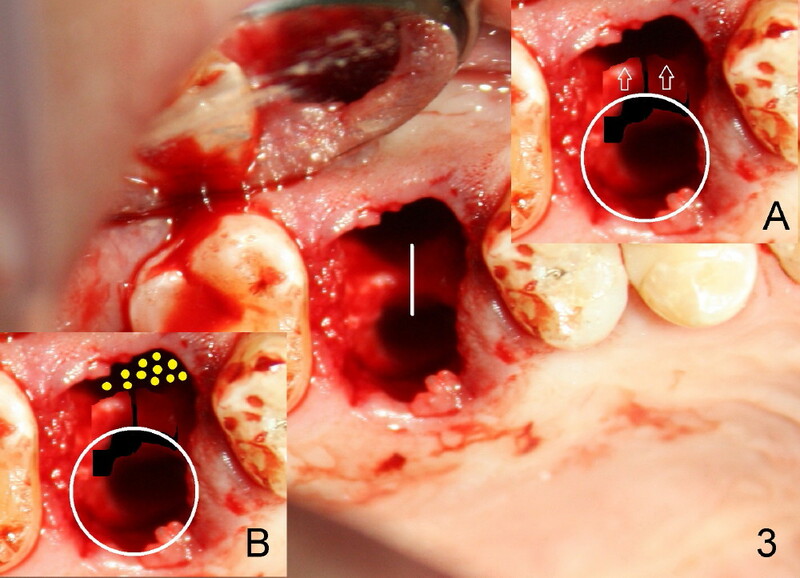 There is no gap between the gingiva and the implant 9 months postop (Fig.9). There is also no bony gap (Fig.8). Fifteen days later, the patient returns for restoration. 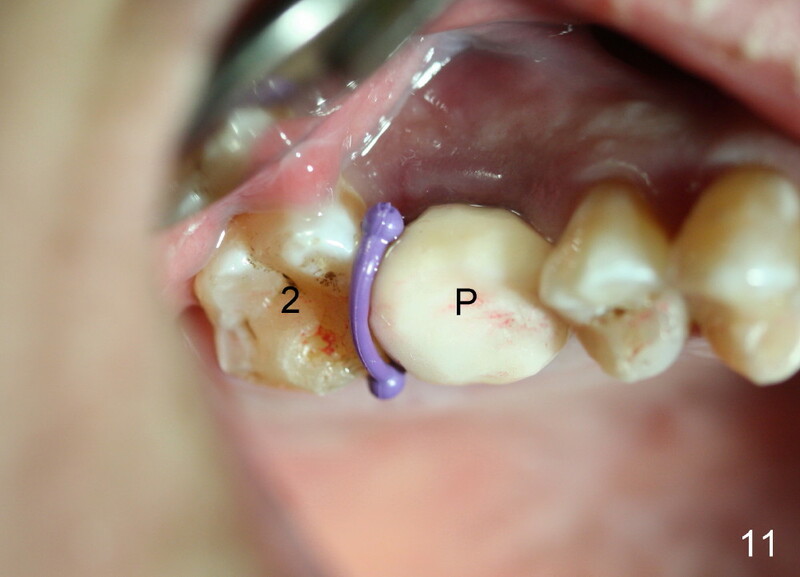 There is no gingiva between the tooth #2 and the implant (I in Fig.10). 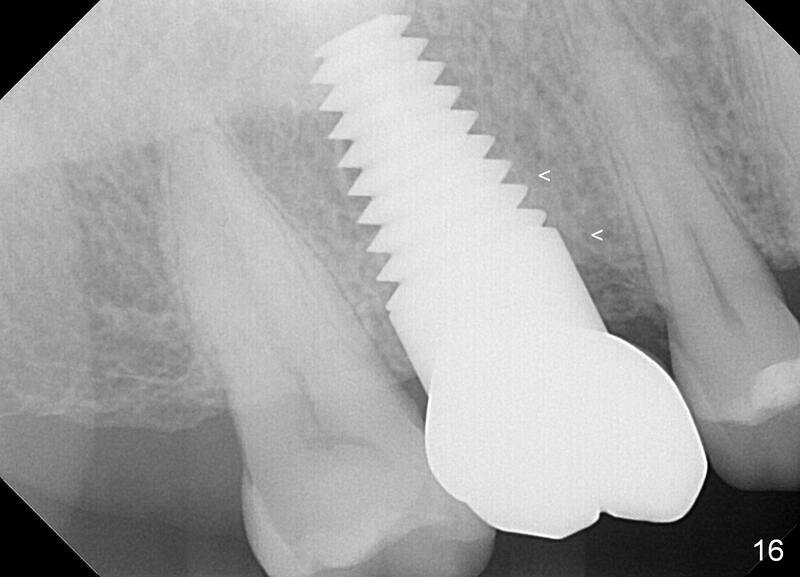 In other word, there is not enough space to prepare the implant. 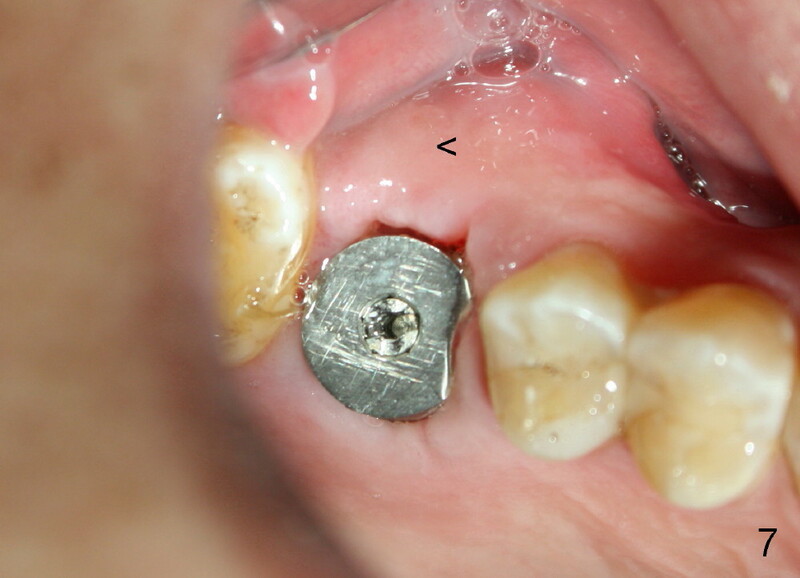 After abutment placement, a provisional is fabricated and cemented (Fig.11 P). 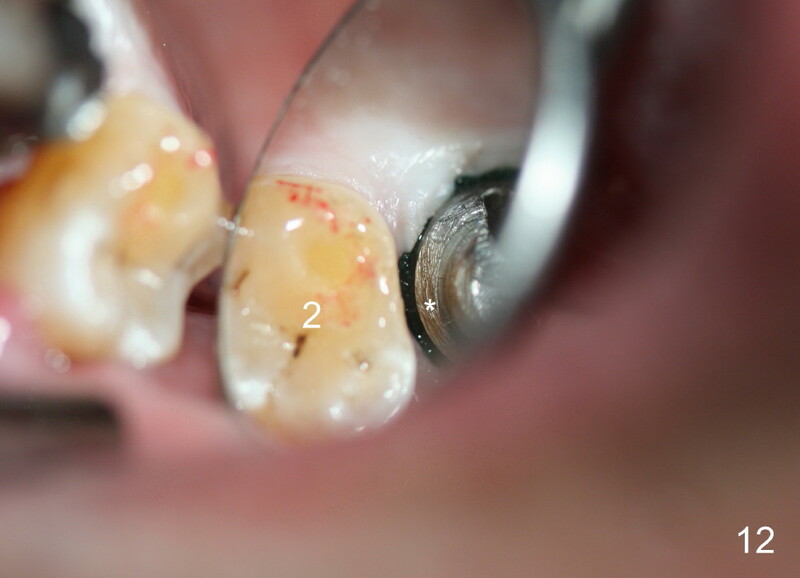 A separator is placed between the provisional and the tooth #2. Once the latter is distalized, more acrylic is added to the distal surface of the provisional and a new separator is placed. 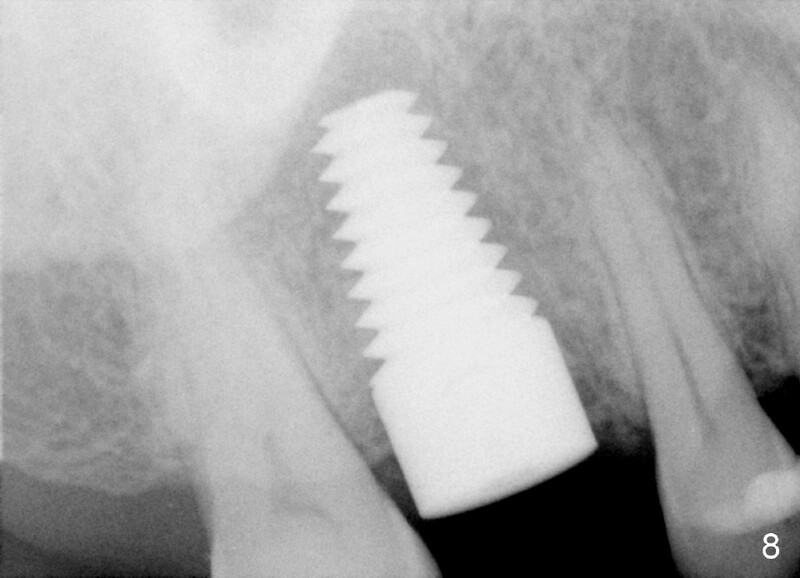 Gradually there will be enough space for implant restoration, i.e. distal margin prep (Fig.12 *). If an immediate provisional were fabricated, the space issue would have been detected instantly and an appropriate treatment (such as limited ortho as mentioned above) could have been started earlier. 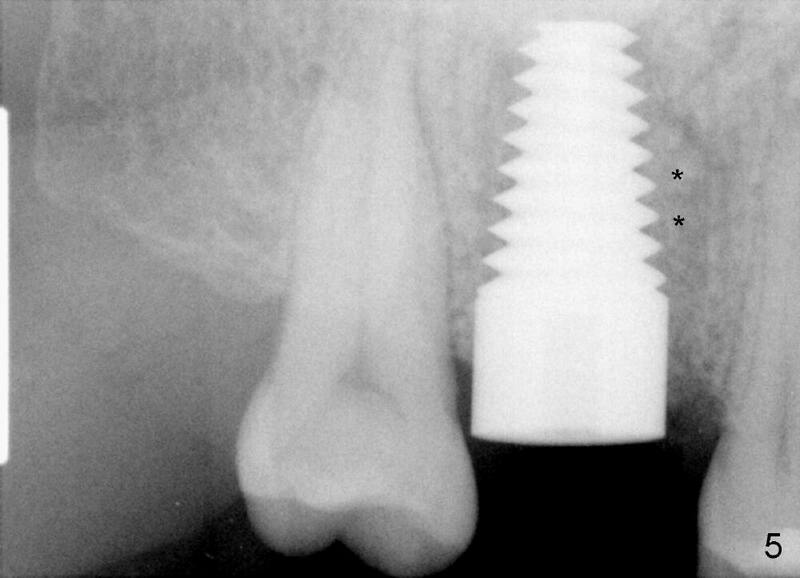 A smaller implant (7 mm instead of 8 mm) may also reduce the chance of the space issue. Bone density between threads increases 4 months post cementation, 15 months postop (Fig.13 *, 14). <: original mesial socket wall. It appears that bitewing may detect crest bone level better (Fig.14). The mesial triangular crestal defect seems to be self repaired 2 years post cementation (Fig.15,16). Bone density around the coronal threads increases (Fig.16 <).